In this game, players can play together co-operatively or go solo as they shoot their way through 3 stages! 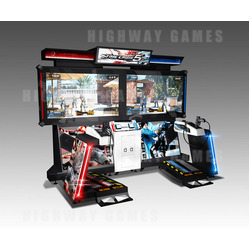 The cabinet features two 55" monitors, 1 for each player, and a new handgun controller design which includes a button for players to cycle through and select weapons with ease and is the first of its kind in the series. The control also includes force feedback recoil and more accurate sensor aim. The cabinet has also brought back the pedal mechanic from previous games in the series, however, each player now gets two pedals - a left and a right - which can be used to move the character left and right, and when released the character takes cover. The stages include the Resort ("Rampage in the resort! "), the Helicoptor stage ("Board an assault heli and level massive damage! "), and the Motorcycle stage ("High speed battle on motorcycles! ").